A trendline is one of the most simple tools to analyze strength and weakness in a stock. Sometimes you can even trade the break of trendlines. 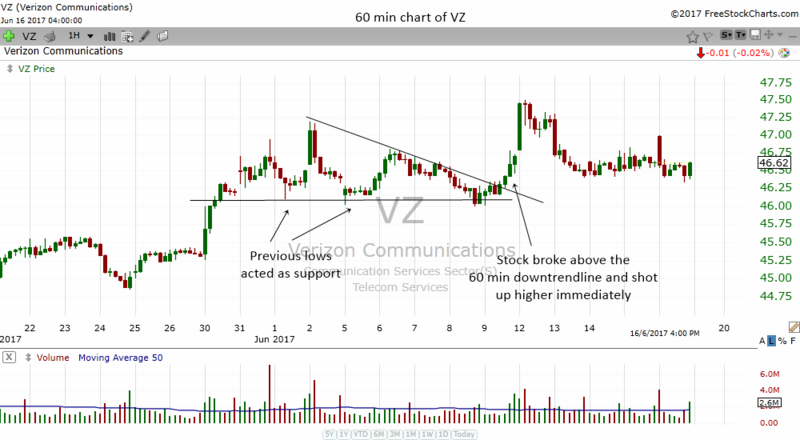 In this article we will examine how the breaking of a down trendline can often help us spot strength in a stock. Some stocks will rise after it breaks a down trendline. Therefore, we need to pay attention when the stock do so. Breaking a down trendline signifies the beginning of a bullish strength in the stock. Sometimes the breaking of trendline works and at other times they do not work. One of the ways to ensure that the breaking of trendlines have a higher odds of success is to see if the stock is breaking a trendline at support. Support is an area that keep a stock from dropping. 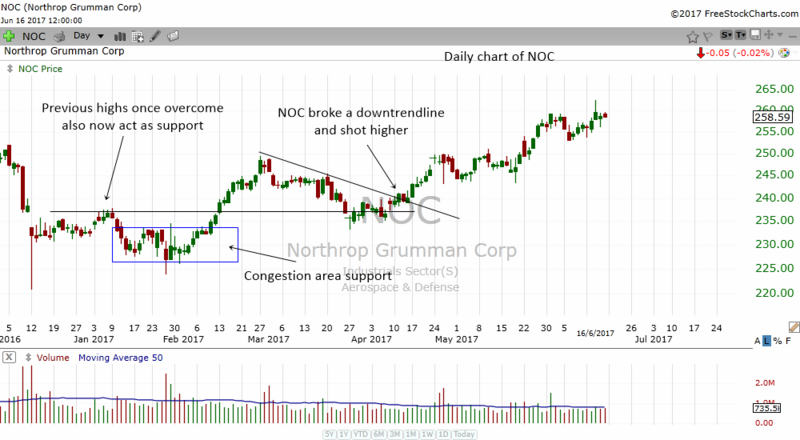 Therefore, if you have a stock breaking a downtrendline at support, it is 2 bullish combinations that may propel the stock upwards. If you are not familiar with the concept of support and resistance, perhaps you might want to revisit earlier lessons in the Stock Market Course that deals with support and resistance. The presence of these two will most likely send your stock higher when it breaks the downtrendline. 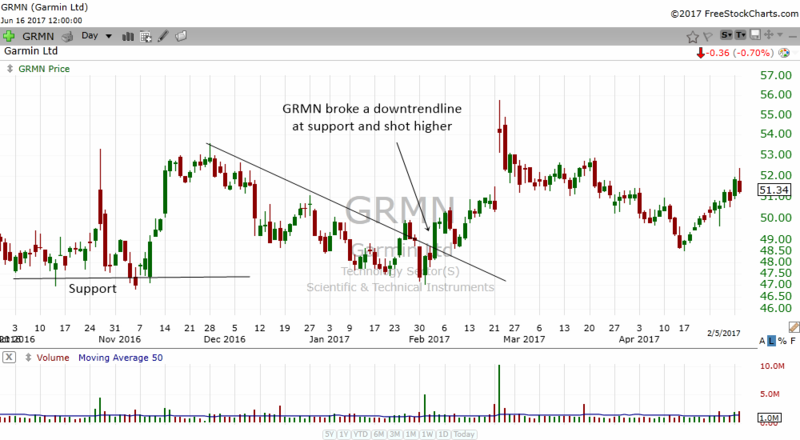 The chart above is the daily chart of GRMN. From October to December, it had formed an area of congestion which now acts as support. Towards December to January, the stock drifted lower. Despite the correction, the stock was correcting in an orderly manner which set up a series of highs which you can connect to draw a downtrendline. Once the stock trades above the downtrendline, it told us that the bears were losing grip on the stock. The support area also starts to bring in the bulls and when the stock broke above the downtrendline, the bulls were slowly coming in. As the bulls became more and more confident, they help to push the stock higher. Notice how the stock moved up rapidly in the next few weeks ending with a nice gap up. This phenomenon of the stock breaking a downtrendline at support can actually offer the astute trader an opportunity to enter the stock at a very low risk but very high reward potential. Stocks tend to stop dropping at support and a break above a trendline often sends the stock higher quite fast. The best of both worlds. Speed and low risk. HCN above is another example of how breaking a downtrendline at a support area can propel a stock upwards. Remember always that a convergence of technical concepts will always be a plus point for a trade. Stocks tend to stop dropping at support and the break of a downtrendline is bullish. 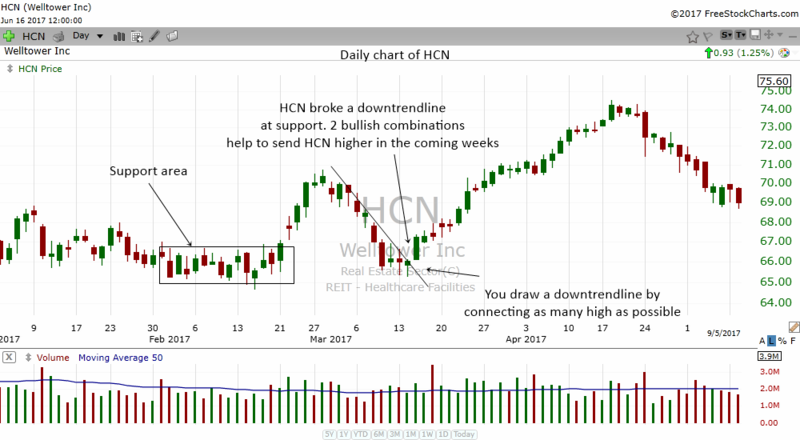 Therefore, HCN went higher for the next few weeks after it broke the downtrendline at support area. The breaking of a downtrendline can often make a stock shoot higher extremely fast in 2-3 days. It is not an uncommon phenomena. Therefore, traders should learn to spot stocks that are drifting lower orderly. Draw a trendline across the tops of the descending candles and buy it once they break out of the trendline. 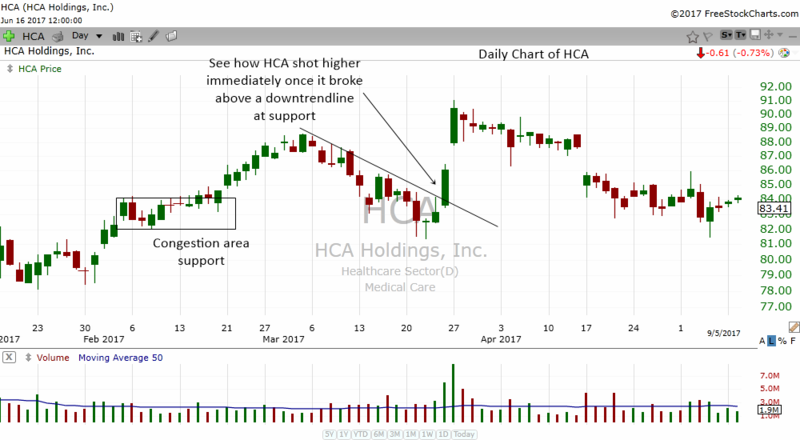 In the chart above, you can see how HCA found support at the congestion area support. At the same time, the stock broke a downtrendline and immediately shot higher for the next 2 days. Pretty nice trade for those who were looking at it. Its amazing how you can trade stocks without even needing indicators. All you need to do is draw a horizontal line or box to see the support area. Then draw a down trendline and just buy the stock when it trades above the trendline. You put a stop at the lows of the pivot point and just sit back, relax and enjoy the profits coming in. Simple as that. Trading should be simple and not complicated. I bet this article would have opened your eyes to how professional traders sees thing. I guess they don't teach you all these things in those $3000 courses. The beauty of trendlines is what works in the daily time frames also works in smaller time frames. Trendlines work very well in 60 min charts and 15 min charts. I think they also work very well in 5 min charts for day traders. I'm not sure if they work that well in 1 min charts, but if you find a stock that have ample liquidity like Apple, you may be able to trade off the 1 min chart looking for trendlines. What you do is essentially the same as you do with the daily chart. You look for support areas in the 60 min chart. Then you see if the stock is breaking a 60 min downtrendline. 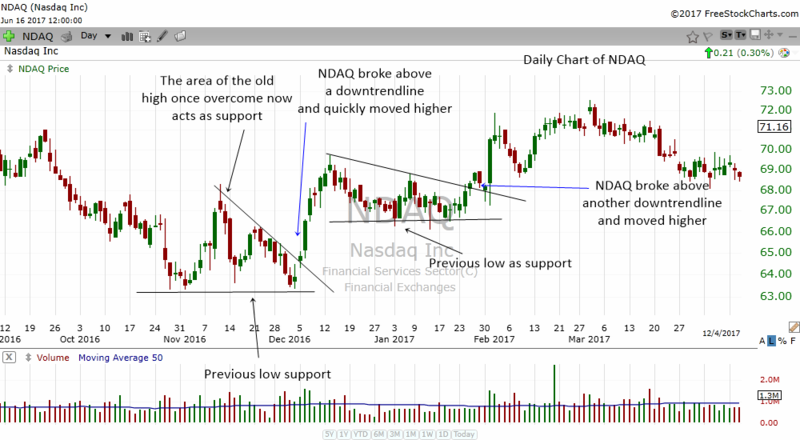 When the stock breaks above the downtrendline, you buy the stock for a nice 2-3 day trade. Sometimes, you can sell the stock by the morning of the 2nd day, sometimes, the stock might have legs and run higher giving the trader a home run. You need to determine whether the stock is trading sideways or trending higher. If the break trendline happens when the stock is trending higher, then you can hold the stock longer hoping it to go higher. That's because a stock in an uptrend tends to go higher. The trend is your friend. 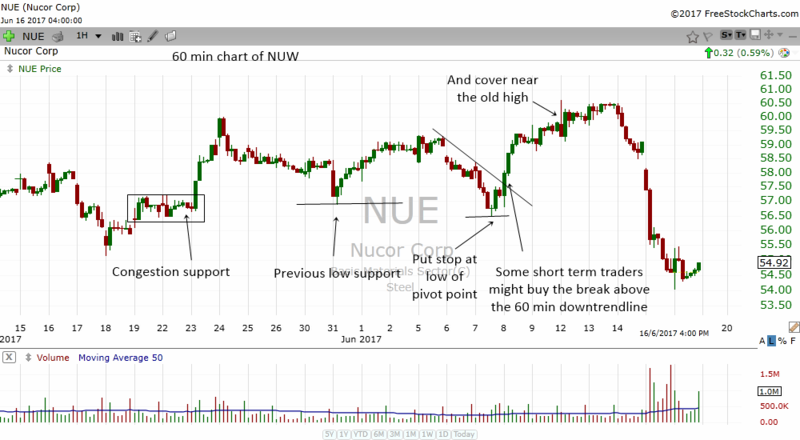 NUE is another example of a 60 min break trendline. NUE had a slight correction from 6 to 7 June 2017. It formed a very nice downtrendline at support area and when it broke above the trendline, the stock shot up higher. However, you want to be careful with stocks that break a 60 min downtrendline. If the stock is trading sideways, the move up might not last compared to a stock that breaks a downtrendline in an uptrend. Stocks can also break a 15 min downtrendline and give traders some nice trade. 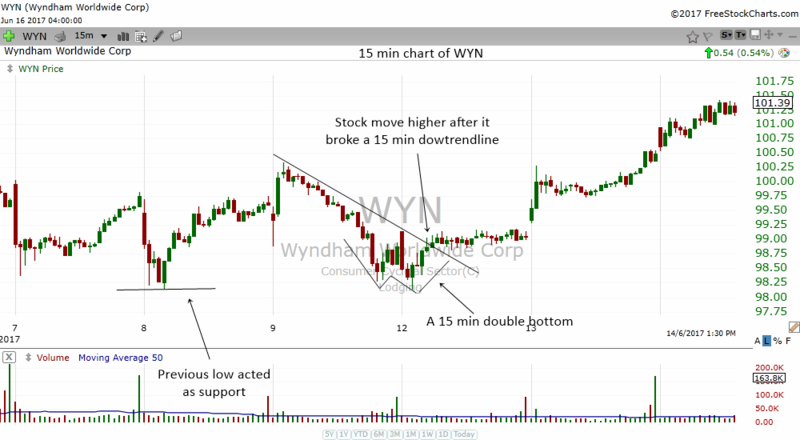 In the chart above, you can see how WYN hit support and break a downtrendline. A bonus was that there appeared a 15 min double bottom. The confluence of technical concepts made the trade highly tradeable. With 15 min trades, you can enter it and exit it the next day. More like a hit and run kind of trade. If the stock trends in the 15 min, you can often find it running higher for a week. If breaking a daily downtrendline can produce a short term trend change, the breaking of a weekly downtrendline hints of a bigger trend change for the long term. The breaking of a weekly downtrendline can bring in a new uptrend in the daily charts which can last for months and months. That is why when a stock breaks a weekly downtrendline at a weekly support, you should pay special attention. 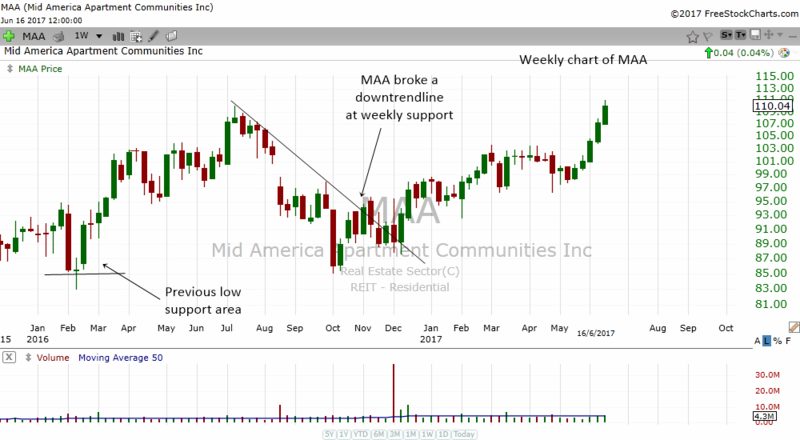 In the chart above, MAA broke a weekly downtrendline at a previous low. The very fact that it broke a weekly downtrendline told us that the stock may be setting up for a new uptrend in the daily chart. Although the move up is a bit slow (because its a weekly chart) the slow trend change still told us that the stock was turning from bearish to bullish. 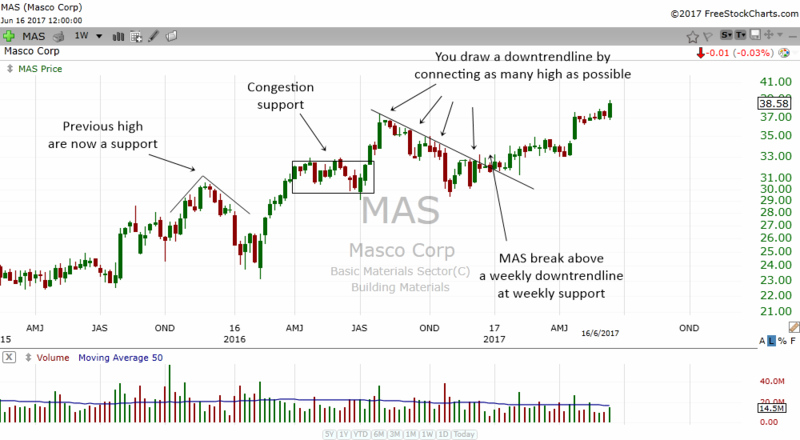 MAS is another great example of a break weekly downtrendline at support. The stock had two supports at the area. First, an old high that was overcome now acted as a support. And then there was a congestion area which acted as support. When the stock corrected and formed a nice weekly downtrendline and broke out of it, it set up a nice trade for traders. Look how the stock went up from there. Here are some more examples of how effective a break downtrendline can be. Do take some time to study them and find more examples on your own. The more you look at them, the more you will discover. The more beautiful the trendline is, the better it will be. The stronger the support is, the better it will be.